What does having an “unplugged” ceremony mean? We’ve seen more and more complaints about the use of cell phones and social media during a wedding ceremony. It can cause a disruption, get in the way of photographers and videographers, and it’s downright rude. Taking pics and videos during the ceremony can take a guest out of the celebration and distract from what is taking place. Some couples feel offended and would prefer to have guest wait until after the wedding, even the next day to have anything posted or shared with others. A wedding is a personal event in the lives of the couple getting married and they have chosen to have a selected few join in the ceremony. Many couples would prefer the guest be in the moment with them and save the social for the reception. So today we are sharing how to have an unplugged ceremony and a social reception. As a bonus, we thought we’d share reasons why you want a website just for your wedding! 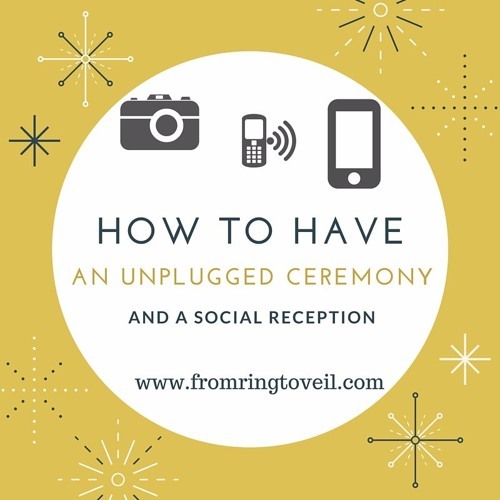 Download Episode #16 How to have an unplugged ceremony and a social reception. Users who like Episode #16 How to have an unplugged ceremony and a social reception. Users who reposted Episode #16 How to have an unplugged ceremony and a social reception. Playlists containing Episode #16 How to have an unplugged ceremony and a social reception. More tracks like Episode #16 How to have an unplugged ceremony and a social reception.